Truthfully, what the world remembers best about Tiananmen Square in 1989 is one of the 20th century’s defining images: ‘Tankman’. Alone, he faced down a column of army tanks for half an hour, standing resolute and unmoving, until he raised his arm to extend a gauntlet of peace, a flower, to the muzzle of the cannon pointed straight at him. The world held its breath at his courage, not yet quite understanding that his gesture derived all its power from the violent confrontation that had taken place on the previous two days, and the massacre which still continued in the nearby streets. 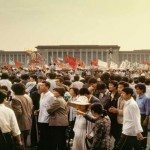 Dissent had been rumbling in a China eager for liberal reform and by May 1989, regular demonstrations had grown into mass protests led by students but with tacit support from urban workers and citizens. Weeks of inconclusive marches brought up to a million protesters to Tiananmen Square, China’s most symbolic rallying point; and around 1,000 students began a hunger strike there. Government elders dismissed them as lackeys of ‘bourgeois liberalism’ and ordered in the troops. By June 2 both sides had resorted to violence as the army sought to clear Tiananmen Square. Casualties mounted. In fact most students left Tiananmen Square voluntarily, trying to avoid a bloodbath. The massacre took place in the surrounding streets. Tanks rolled over bodies and soldiers kept up withering semi-automatic fire on packed crowds who had no chance of escape. Students fought back where they could – but though the Chinese Army (PLA) is composed mainly of draftees, who might be expected to be sympathetic, unarmed protesters were brutally suppressed. Using the excuse of martial law, and the cover of night, troops literally crushed what had become a rebellion. Thankfully, as ‘Tankman’ proved, though the soldiers won the ‘battle’, they simultaneously realized they could not win the moral war. Death toll: Exact casualty figures remain a Chinese state secret. Student organizations can name 1,100 dead known to them. You should know: Workers and other civilians supported the protesters constantly with food, water, money and goodwill. Many times, rickshaw drivers braved the firing in no-man’s-land to pick up wounded citizens and students and get them to hospitals.